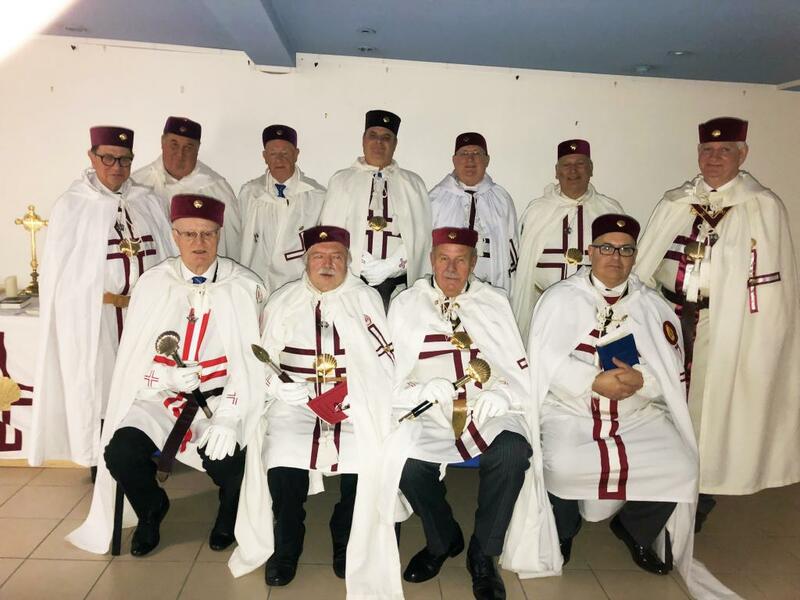 On Saturday the 6th April 2019, the MW Grand Master, Sir Melvyn of Wud Plumpton KH, accompanied by a small but enthusiastic number of the Grand Team went to Tours in France for the purpose of consecrating our newest Chapel. Since the Consecration of Saint Jean d'Acre Chapel, No. 110 which works in Paris (in English), on the 31st May of 2014, the Order has blossomed very nicely with Chapels now working (in French) in Nice, Toulouse, Albi, Vienne and Villeneuve D’Ascq. A further chapel works in Paris (in French) and Saint Gregoire de Tours Chapel No 133 at Tours take the number of Chapels to eight in five years! Our French colleagues were rewarded for their enthusiasm for our ceremonial when the Province of France was constituted on 16th October 2016 by Sir Melvyn. Their Right Worthy Grand Preceptor for France, Sir Christian of Marzan, Christian Pajolec, works tirelessly ably assisted by his Provincial Prior Sir Dominique of Montmirail, Dominique Madej, Provincial Marshal, Sir Bernard of Tyre, Bernard Wakim and not forgetting that very hard-working Knight the Provincial Secretary, Sir Jean-Paul of Tourgeville. Jean-Paul Dupinay, who is also Asst Grand Secretary in the Order, to spread the ‘Word’ not only across France but into those surrounding areas which are, as yet, not served by Order. The signs are looking good with much talk of further expansion in Europe. Tours is an historical town with many links to Templar Masonry and whilst in the Area several of the team took the opportunity to take in the local culture. The New Chapel will work from the Masonic Hall in Tours (8 rue de la Bourde) and meets on the 2nd Thursday of October (I) and June, at 10.00 am. If you are in the area, take your regalia, you are sure of a good French welcome. Once the Grand Master had consecrated the Chapel and the officers had been invested, he invested Sir Jean-Paul as Asst. Grand Secretary and welcomed him into the Grand Team. The knights retired to the restaurant to complete the days work, all wash down with superb wines from the Region. 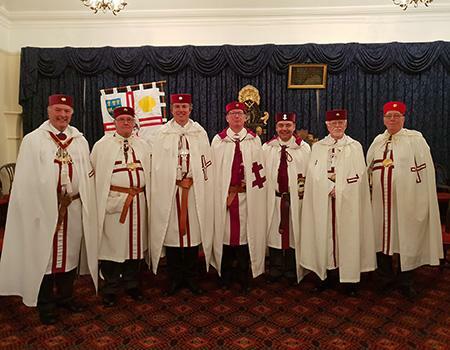 Sir Christian of Marzan, RW Grand Preceptor for France, Sir Dominique of Montmirail, RE Grand Prior of France, Worthy Master, Sir Melvyn of Wud Plumpton KH Grand Master, Sir Lee of Bromley by Bow, Grand Prior and (stood of the right) Sir James of Nijmegen KC, Grand Marshal. 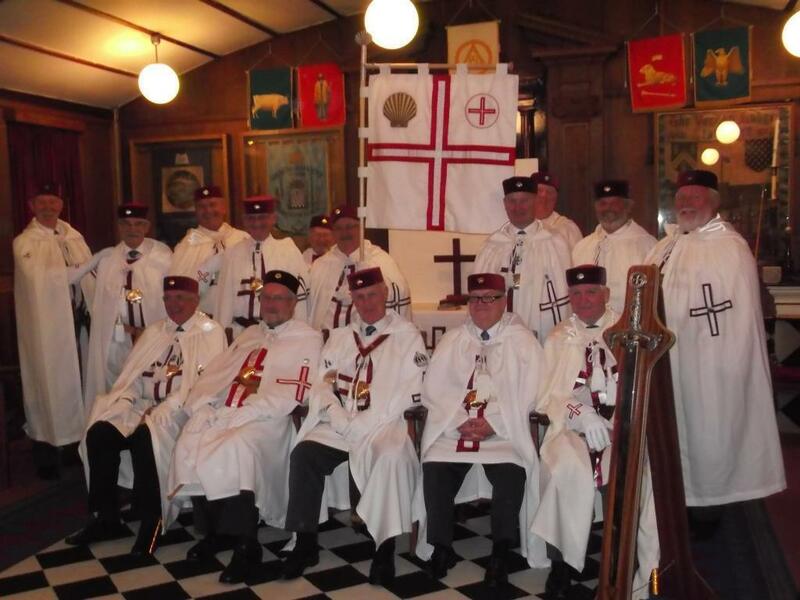 In September 2018, The Grand Secretary received an enquiry from a group of Knight Templars on the Island of Jersey. They are led by RE Kt. David Rosser, PGt1st Constable and amongst their number were many Notable Masons from the Channel Islands. In short the request was, ‘We would like to open a Chapel on Jersey, how should we proceed’? 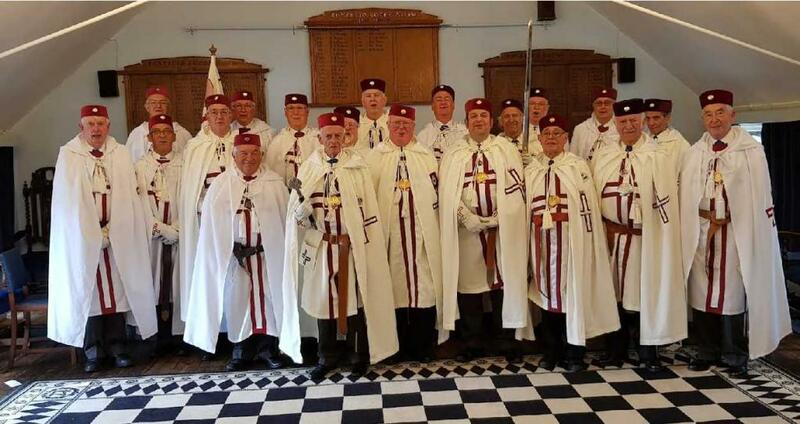 Six months later, on Saturday 23rd March 2019 and the Grand Master took an extremely large number of the Grand Team to Winchester Masonic Hall where in St Swithun’s Chapel No. 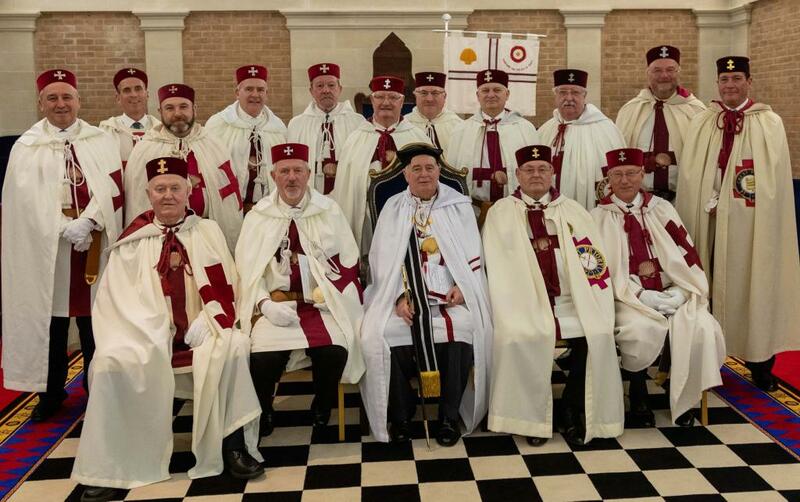 96, no less than fifteen Templars were admitted as Knights of our Order, with the sole purpose of founding the Chapel of Richard Duke of Normandy No 134, which will hold its meetings in the Masonic Temple, St Helier, Jersey on the Third Saturday in June and January. 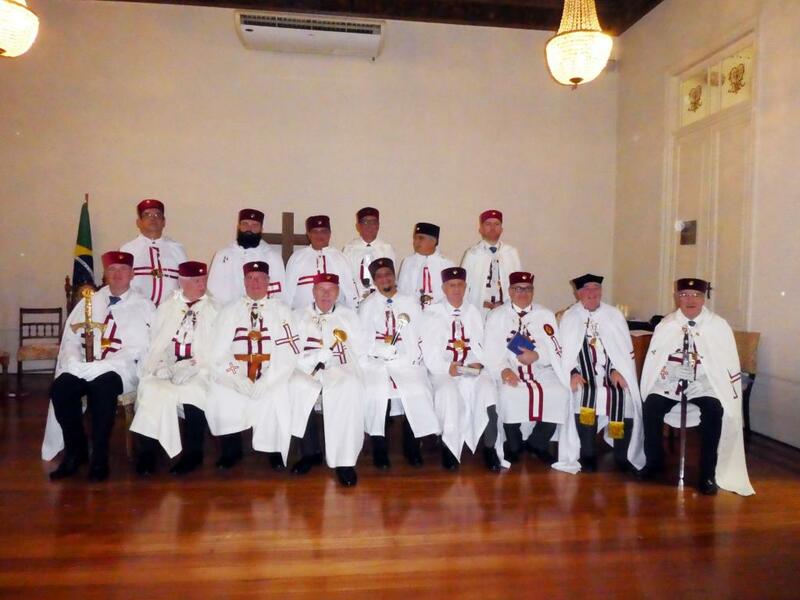 Photo 1 The Knights from Jersey wait for the Consecration to start. The Worthy Master of St. Swithun’s, Malcolm of Iford, and his Eminent Prior, Malcolm of Old Meldrum, who were ably assisted by Knights of the Chapel and Visiting Knights with a special mention of the Acting Marshal and Deputy Marshals Sir’s Ralph of Ludlow & Leslie of Warsash conducted a very sympathetic and well conducted ceremony of admission, not easy with so many Knights to invest, and proclaim. 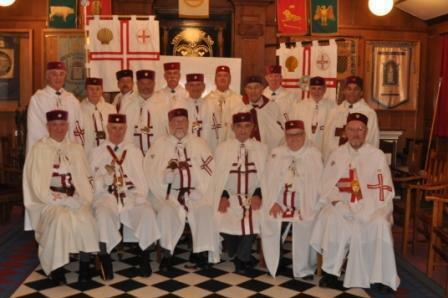 The Grand Master retired with Senior Knights of the Order whilst the Chapel was closed. 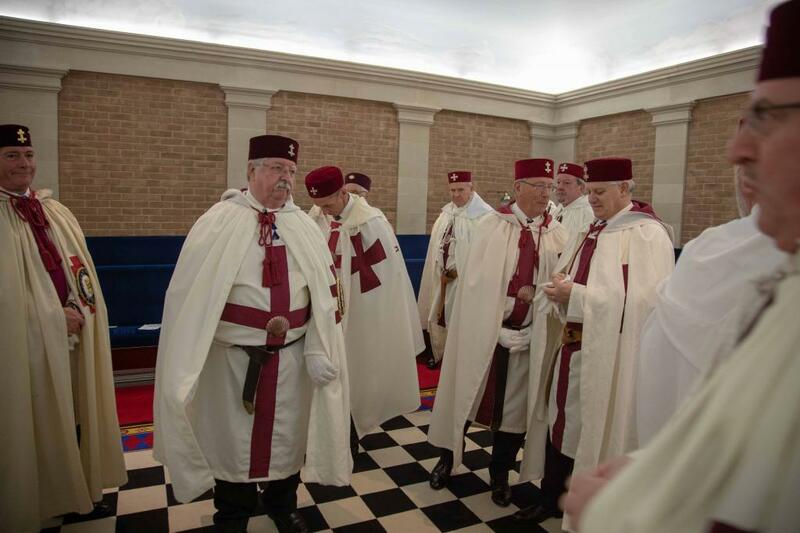 Following a short break, during which the Grand Marshal, Sir James of Nijmegen conducted a short practice for the benefit of our new knights, The Grand Team processed into the Temple and Sir Lee of Bromley by Bow, Grand Prior, opened Grand Masters Council. The Grand Master, Sir Melvyn of Wud Plumpton, then conducted the Consecration of the New Chapel, in the time-honoured fashion in his usual relaxed style. Sir William of Marchwood, our Protector of Canterbury was installed as Master and presented with the Baton and Warrant of the Chapel along with the Constitutions of the Order. Sir William then invested his Prior, now known as Sir David of Hautefage, (David Rosser), and then the remaining Officers of the Chapel. 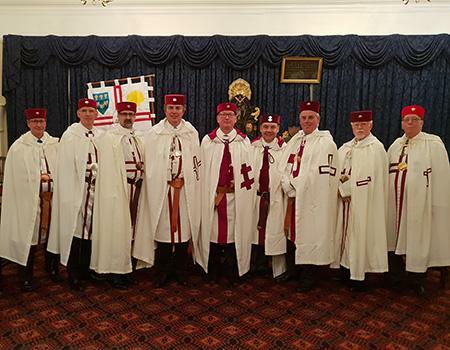 Following the adoption of the By-Laws the Consecrating team and the RW Grand Preceptor for Hampshire and the Isle of Wight, Sir Anthony of Southampton, were all elected as honorary members. The Grand Master responded on behalf of them all. The Prior of St. Swithun’s Chapel, then presented the Knights of the New Chapel with the Bible on which they had taken their Obligations for use in the Chapel. The knights present greeted this with acclaim. The Grand Team retired and once the new chapel had closed, we all retired for reception drinks and then into a social board reflecting the importance of the occasion. The atmosphere throughout both the ceremonial and social parts was tremendously friendly, and the buzz of this happy occasion will last in our memories for many years to come. Photo 5 Sir William of Marchwood, Protector of Canterbury Worthy Master responds. 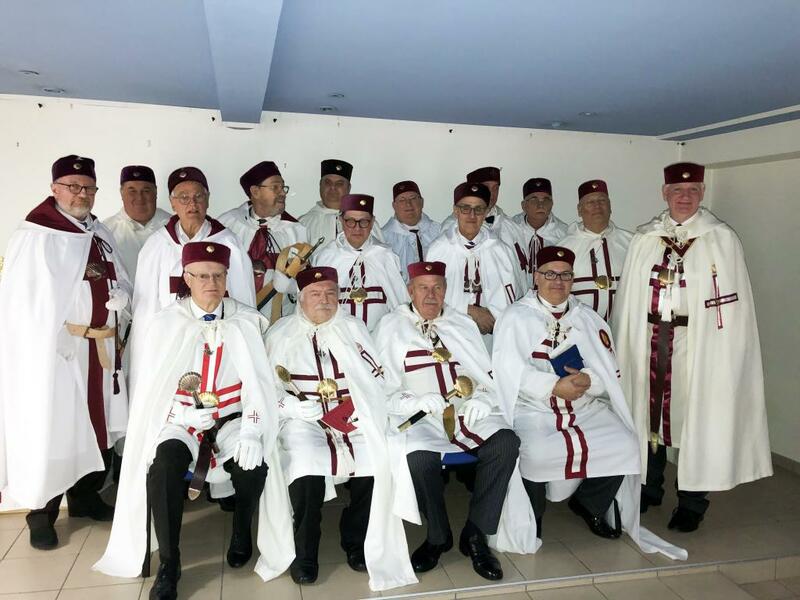 The Consecration of Chapel No 134, is the fourth this year and with another scheduled to take place in December in Tours, goes someway to prove that our Order is buoyant and heading in the right direction. The Order is indebted to Sir’s Colin of Furness, Provincial Secretary Hampshire and the Isle of Wight, and Arthur of Timsbury, Dep. Provincial Secretary also the Chapel Secretary of No. 96 for all the hard work they put into organising the occasion. The Grand Secretaries Office is now open to receive further petitions for new Chapels..
Report by Sir Michael of Accrington, Grand Secretary, Photographs Courtesy of Sir Colin of Parr. 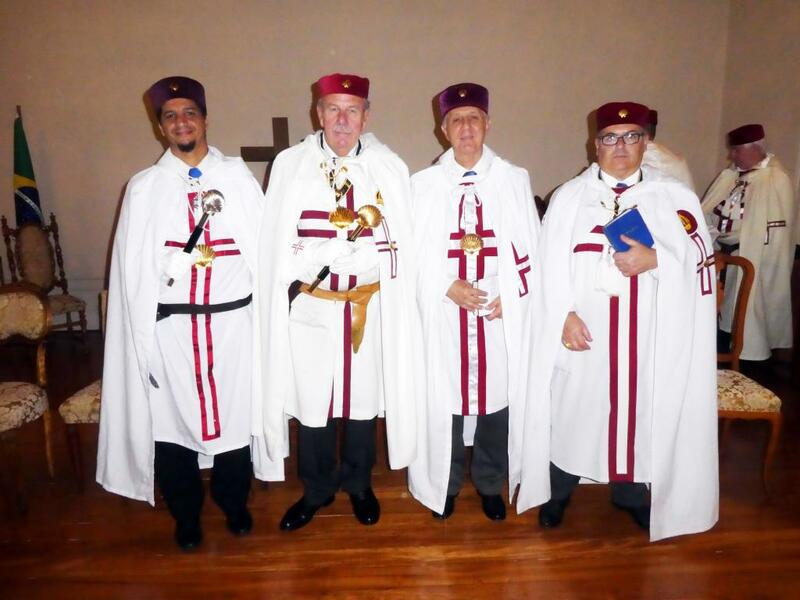 Consecration of Three Chapels and Constitution of the Province of South America and more! 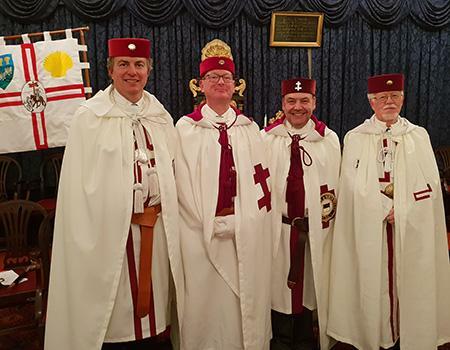 Very early on a cold and damp morning Friday the 11th January 2019, The Most Worthy Grand Master, Sir Melvyn of Wud Plumpton and a small number of the Grand Team set off on the long journey over to Rio de Janerio to consecrate Three New Chapels and form the Province of South America. The trip, for the main group involved getting to Manchester Airport, flying down to Charles de Gaul Airport in Paris and then changing planes for the final leg over to Brazil. As you will appreciate, whilst Brazil is only two hours behind the UK, the distance is considerable, and we were in the air for around 14 hours in total. On disembarking in in Rio, we found that our luggage hadn’t landed with us! The temperatures, in the mid 30’s most of the time, made for a very uncomfortable day waiting for it to catch up with us, fortunately we had planned time to acclimatise and didn’t need our regalia until the Monday, so all was well eventually. Sir Alexander of Rio de Janerio had sorted out our accommodation and entertained us in that time, but in no time at all, we were off to the Masonic Hall in ‘Downtown Rio’ to prepare ourselves for the ceremonial. As at all these events, the ceremonial is arranged and circulated around those involved well in advance of our setting off on the journey, but when 90% of those attending those ceremonies doesn’t speak English and 100% of us don’t speak Portuguese, anything can happen! Again, Alexander came to the for and was able to translate all that was needed to the founding Knights of the Chapels, and the ceremonies went off without a hitch, well that is ignoring me murdering the Portuguese Language when pronouncing the Knights names as they were appointed! At least it got a laugh all round!! Venerável Mestre Padre João Ribeiro Chapel, No 130. On the Second day Spiritus Sanctus Chapel, No. 132 was Consecrated and then The Most Worthy Grand Master called for the Grand Marshal, Sir James of Nijmegen to be presented to him. The Grand Master then promoted Sir James to the Honour and Dignity of the Rank of Knight Caritas. All applauded this popular Promotion. 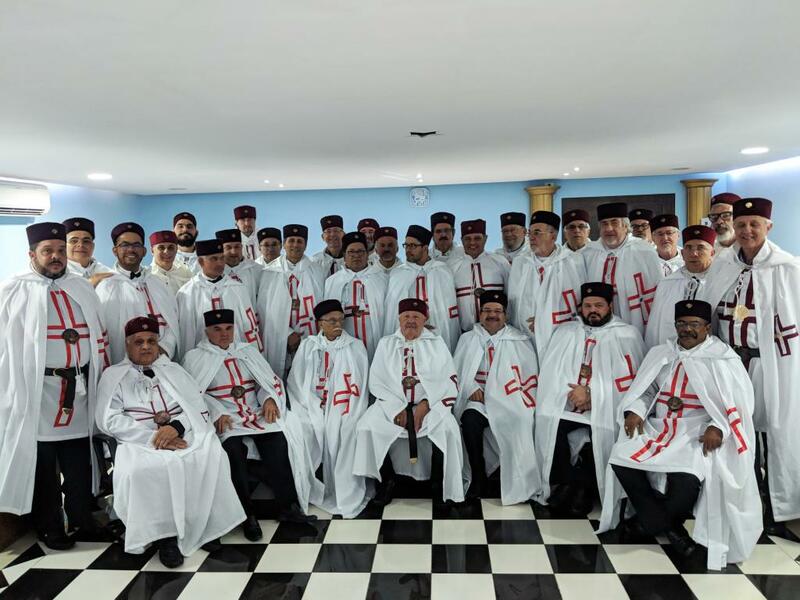 The consecration of the three new Chapels takes Brazil to four units with their mother Chapel Grão Mestre Desembargador Murilo Pinto Chapel No. 113 and following a short break in proceedings the Grand Team re-entered and the Province of South America was constituted. 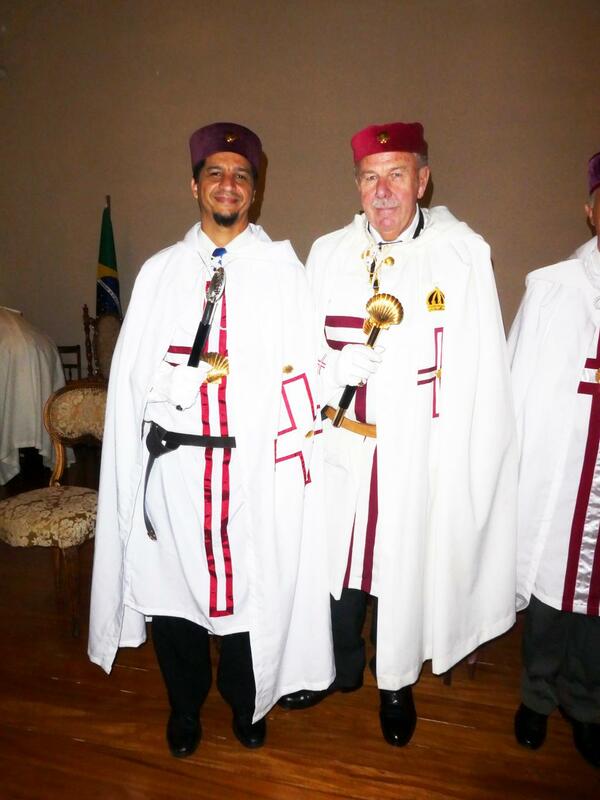 Sir Alexander of Rio de Janerio was appointed as the first Right Worthy Grand Preceptor of the Province. He then appointed and invested his Provincial Team before we left them to discharge their domestic duties. After each of the Ceremonies we had a photo call, to place on record what a wonderful time we had all had in such great company. The following day, we all pack our cases and set of back home. When the main party reached Manchester, this time with luggage! It was a magnificent 1° with a biting wind chill making it feel colder than ever. 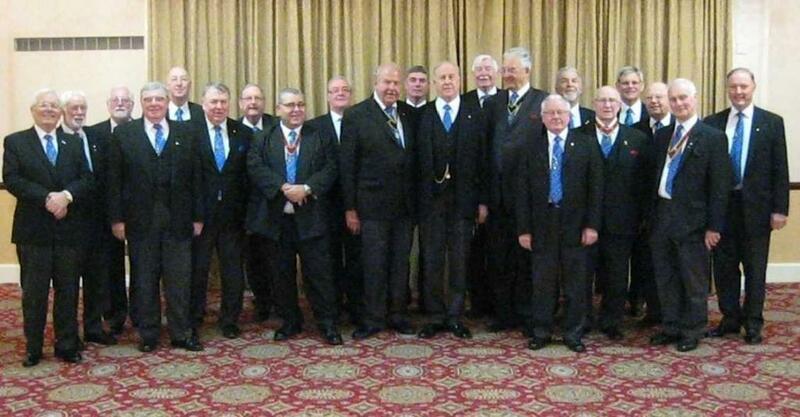 Those from the Grand Team who went to assist the Grand Master, were Sir Lee of Bromley by Bow, KH, Grand Prior, Sir James of Nijmegen, KC, Grand Marshal, Sir Michael of Accrington, KH, Grand Secretary, Sir Terence of Mildenhall, Grand Historian, Sir William of Marchwood, Protector of Canterbury, Sir Antony of Cottam, Grand Sword Bearer and Sir Daniel of St Albans Assistant Grand Marshal. The Grand Master sends his thanks to all involved for a successful visit to Brazil. Sir Michael of Accrington, KH. On Wednesday the 7th November 2018, I braved the journey south along the M6 from my home in Leyland on my way to Buckley Cross Chapel, who now meet in Chester at the Queen Street Masonic Hall. It was my first visit to Chester on Masonic Business and there is always a feeling of not knowing what to expect. I was certainly not disappointed, the building is a fine example of a well-established hall, steeped in tradition, plenty of dark oak woodwork and twisting corridors that you feel you never find your way back to Lodge Room should you stray too far. This was not a problem; my hosts were always ‘not far away’ making sure I didn’t get lost. In no time at all we were sat in the Chapel waiting for the opening. I had time to catch up with an old friend Sir Harry of Benfro KC, the Past RW Grand Preceptor for Wessex, who had come up to visit the Chapel as a guest of Sir Fraser of Gariochsford. Fraser Fowlie. It was comforting for me to look around the room at so many friends that I’ve made as KT Chancellor of Lancashire with the Cheshire and North Wales Provincial KT hierarchy being present in goodly numbers, Sir Anthony of Nantwich, Tony Mathie acting as Prior, and Sir Michael of the Roft, Michael Steggles, as Master. We were bound to be in for a good night. And they did not disappoint me! 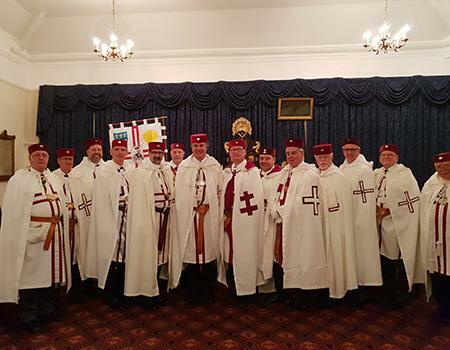 The main business of the night was to Install two new brother knights, and the Sir’s Andrew of Castletown & David of Murcia were admitted in a superb manner by the team. Following this and during the risings I have the honour of presenting six knights with their membership certificates, including the two new knights. The Chapel had been consecrated and met, as the name suggests at Buckley Cross. The venue was not right for the Chapel, which started to suffer membership issues. Fortunately, enough members decided to do something about it and among other measures moved the Chapel to Chester. Since then it has flourished and it now mother Chapel to a young and vibrant membership who know how to work and play. After the Ceremonial, we retired to the Festive board which was a delightful meal, suitable washed down by as much wine and port as you could manage. Why was I driving tonight! The wine taking, and toasts were short and around 10pm I was on my way back to the Motorway to head north feeling well satisfied at having spent another evening in the company of good friends. My thanks to the Secretary, Sir David of the Dee, Meacher-Jones, for making the arrangements at short notice for my visit and all the knights of the Chapel for the welcome and hosopitality. 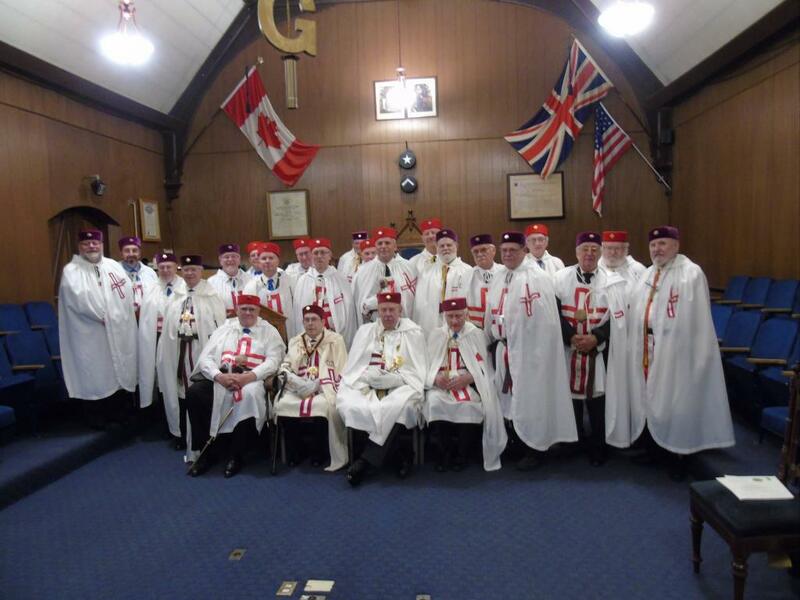 October 30th saw a visit of the MW Grand Master to Canada to a meeting held at York Chapel No 66 at St Claire Masonic Hall, 6321 Regional Road 25, Milton, Ontario. At this special meeting the MW Grand Master appointed and invested Sir Gordon of Port Perry to the Chivalric Order of Knight Caritas. He was proclaimed by the Herald and saluted by the Dep Grand Marshal. The MW Grand Master then appointed and invested Sir Howard of Sheffield to the rank of Past Assistant Grand Marshal. 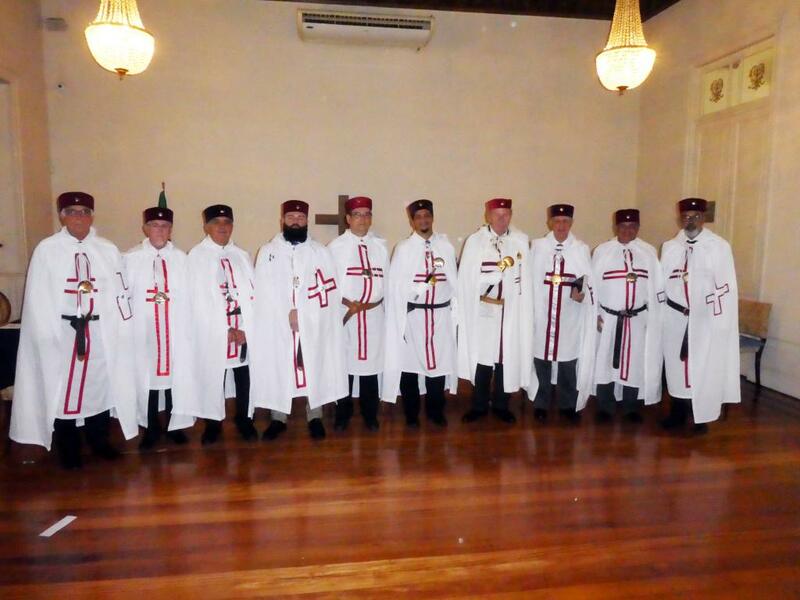 The festive board was held prior to the meeting and with the following members who hold high rank in other orders in attendance. Sir David of Avalon (David Hardie) - The Sovereign Grand Master of the Sovereign Great Priory of Canada. Sir James of Brampton (James Leutri) - The Chief Adept for the SRIA of Ontario Central. Sir Brian of Strathclyde (Brian Manson) - The Deputy Grand Master of Royal and Select Masters of Ontario. 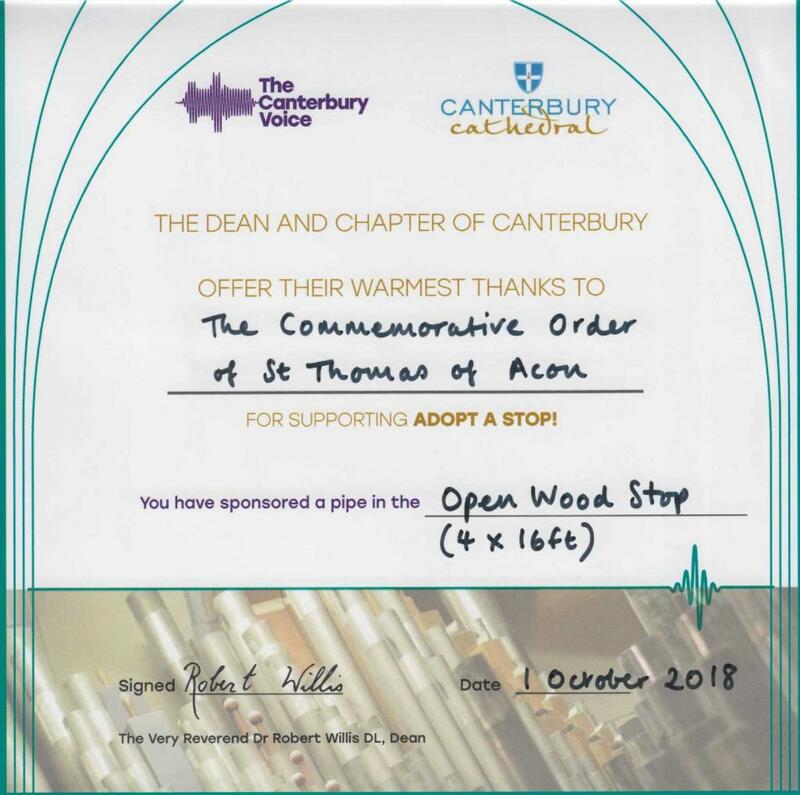 Following the presentation of the cheque for £4,000 in favour of the Organ Stop Appeal, made by the Grand Master during the Pilgrimage to Canterbury on the 29th September 2018, we have now received a Certificate from Canterbury. This is shown below. The appeal which will run for several years yet, and it is hoped that a further donation will be made in the future by our Order. The Grand Master thanks all who have donated, Individual Knights, Chapels and Provinces so far. Please keep the donations coming in. As any member of our Order knows, Thomas Becket, Canterbury and Devotion are keywords! We as an Order have been attending Canterbury Cathedral for many years to pay our homage to our God and respect the memory of that Great Inspiration to us as an Order, Thomas Becket. Sadly, due to matters outside our control, last year we were unable to hold our Pilgrimage at the Cathedral, but we were determined to return as soon as we could. Our new Protector of Canterbury, Sir William of Marchwood, The Reverend Bill Whitfield, has worked tirelessly, with the full backing of the Grand Master and myself, over the last twelve months in what became a most successful negotiation, resulting in restoring the event in our busy calendar. Sir William is a modest man, but those of us who are in ‘the know’, are aware of the toll, that the task we gave him, placed upon him, his health and his life over the last twelve months. Bill, Thank You, somehow, does not seem anywhere near enough, in terms of gratitude, but is sincerely meant by us all in the Order. 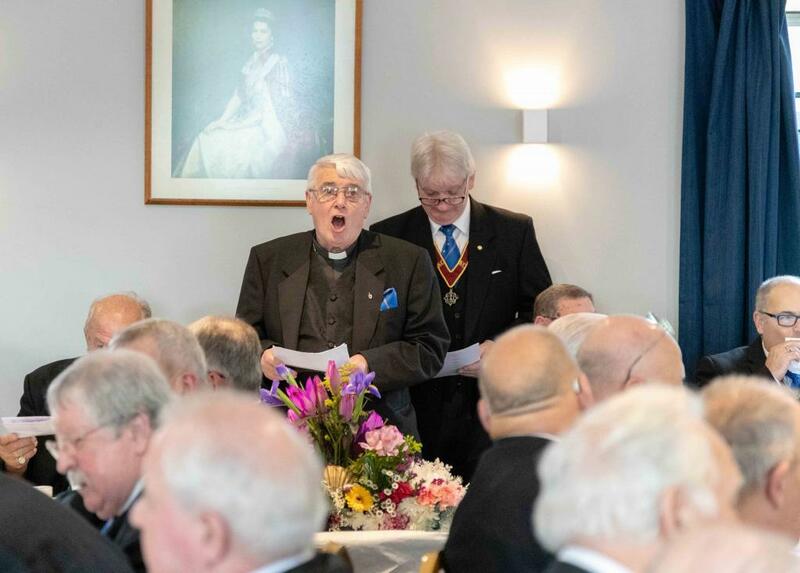 Now, back to the day, The Grand Master, Grand Prior and several members of the Executive travelled down to Canterbury to join the some 160 plus members, wives and friends who had ‘booked in’ for the buffet at the usual venue, ‘The Pilgrims Hotel’. First however the Grand Master, Tony Cross and I, along with Sir Alexander from Rio de Janeiro and Sir Felipe of Macuco, both of whom had travelled all the way from Brazil! visited the Museum of Freemasonry at the Masonic Hall in St Peter’s Place, right in the heart of Canterbury. I had previously circulated the Museum’s existence & facilities to the membership and I’m pleased to say that several other knights came to have a look around whilst we were there. Roger O’Brien, Sir Roger of Canterbury, the new RW Grand Preceptor of the South East Counties, who is trustee of the museum made himself available to show us round and explain the significance of many of the exhibits. Thankyou Roger, it was very interesting. Then down to the Pilgrims hotel for lots of ‘networking’ and lunch. Now Stan Brown, ‘Stan of Croydon KC, had worked his usual oracle, and a superb buffet awaited those who had booked in. This year numbers were up, and this necessitated opening a further expansion area, (which will be opened from the moment we arrive next year) to accommodate the increased numbers. Buffet consumed, and we were able to take a gentle stroll down to the riverside and along the myriad of ancient byways on the way to the Cathedral. There was time for a coffee in one of the many the local coffee houses, whilst the gathering masses formed. We were soon on our way into the Cathedral, led by Sam Royle, the gracious lady that I deal with in relation to our donations to the Cathedral Trust and its various fund-raising events. It was an impressive sight to see the huge following as we descended into the vault for our celebration ceremony, well over the 200 mark, the best attendance so far! Before our devotions commenced, the Grand Master addressed those present and thanked them for attending in such good numbers. He went on to present the Arch Deacon of Canterbury, Very Rev’d. Jo Kelly-Moore with a cheque for £4,000.00 in respect of the Organ Stop Appeal. The donation was gracious accepted, and quickly passed to Sam, who then thanked everyone present, not only for the donation just given, but also the magnificent donations in relation to the previous appeals, well in excess of £40.000. The ceremony then commenced with readings from a Past Grand Prior, Michael Harridine and the Grand Prior, Sir Lee of Bromley by Bow KH. The address by Sir William was well received, being not only appropriate, but of an appropriate length! Well done, again, Sir William. Following the closing, the knights retired, many staying for evensong. Others made their way along, what for some was a long journey home. Knights attended from the UK, (all Provinces), Brazil, France, Switzerland, Belgium, Holland and very possibly many other areas. Our one regret is that we could not meet and greet you all personally, but we did give it a good shot! There was time to view the plaque which records our support for the previous appeal for repairs to the building, repairs which are now well underway, scaffolding was everywhere! What more could a freemason wish for, but to leave his meeting with a warm and contented feeling of a job well done, Sir Knights the Job was Well Done, and our donation will, once again, be faithfully applied. Brazil goes from strength to strength. Grão Mestre Desembargador Murilo Pinto Chapel No 113, was consecrated at Kings Heath Masonic Hall, Birmingham on Monday the 16th April 2014, a day I remember well. 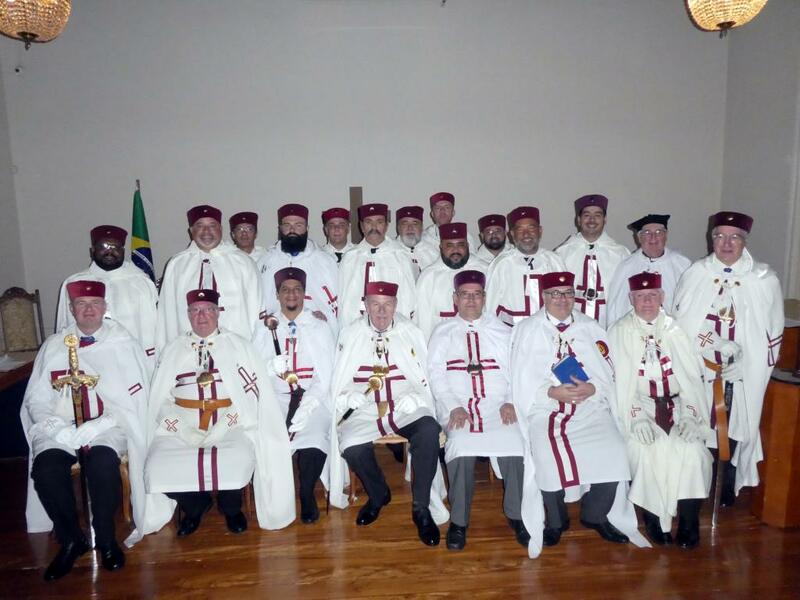 A number of Masons from Brazil had come over to the UK joining other orders and were intending returning to Brazil to develop those Orders, and why not take our special Order with them back to São Paulo! As Deputy Grand Secretary at that time, I was Acting as Grand Secretary for the consecration and there was much that made the day memorable, not least was hearing the Lords Prayer recited in Portuguese by the candidates. It was my first visit to Kings Heath and Chapel of the Holy Innocent No XIII, who meet there were our hosts for the day admitting the knights before the New Chapel was consecrated. I, in addition to the other members of the Consecrating Team, were made honorary members of the Chapel as is customary on these occasions. When I was appointed as Grand Secretary, I had need to contact Chapel on some constitutional issues and as a result Grand Masters Council took direct control of the Chapel and Sir Alexander of Rio de Janeiro, Alexander Mazolli Lisboa, a member of the Chapel, was appointed as an Assistant Grand Secretary and given the task of putting the Chapel back into Constitutional Order. This he has done in an exceptional manner. The Chapel found a new meeting place and is now uninfluenced by ‘outside parties’. Alexander is a very capable mason and is frequently over here in Europe where he is a member of several orders. His range of contacts both in the UK and Brazil is second to none. 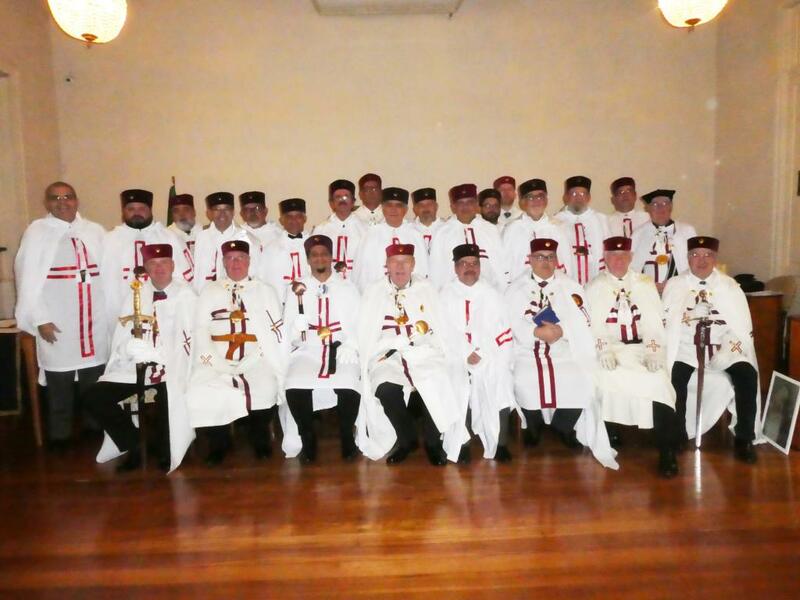 Such is his circle of friends and acquaintances that 113 now has an active membership of seventy-nine knights. The Chapel has already sufficient members who have successfully petitioned to form another Chapel in Rio de Janeiro to be called Master Felício de Paulo Chapel and will be numbered 129. 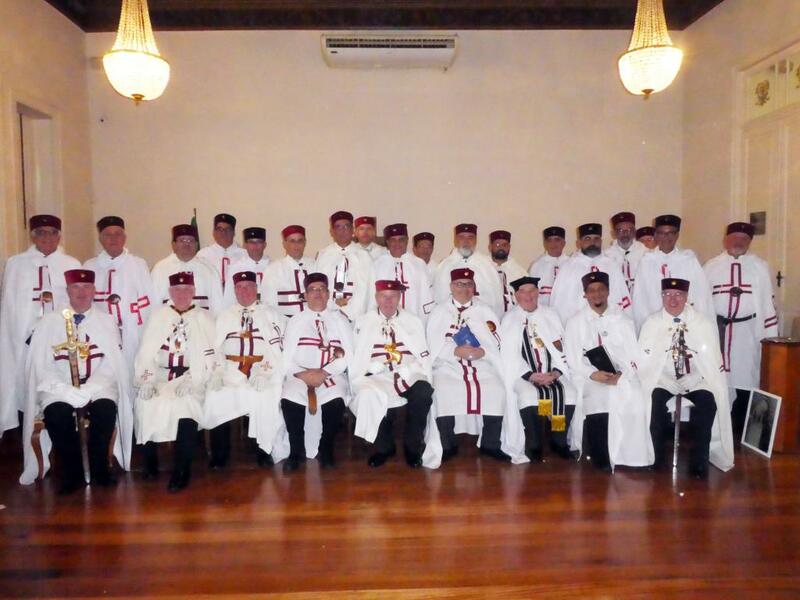 On the 15th of August they admitted by dispensation a further 19 knights, 17 of whom are to form a Chapel in Recife and the remaining 2 are members of 113. 113 already has one member from Vitória, in the State of Espirito Santo, and he will be joined by a further20 in October. They will then go on to form a Chapel based in Espírito Santo. All this adds to work of the Grand Master and his team and the consecrations will now take place sometime early in 2019. Well done Alexander and well done 113. On a glorious sunny morning on the 21 July 2018 something stirred in the Town of Uckfield, in East Sussex. There was a certain hum going around that something was going to happen about the place as some 50 or so members of the Order of St Thomas of Acon attended the Masonic Hall for a ceremony par excellence, that would culminate in the Installation of Sir Roger of Canterbury (Roger O'Brien to you and me) be installed as the Grand Preceptor of the Province of South Eastern Counties. Taking over the reins from Sir Brian of Baldwins Hill (Brian Prevett). 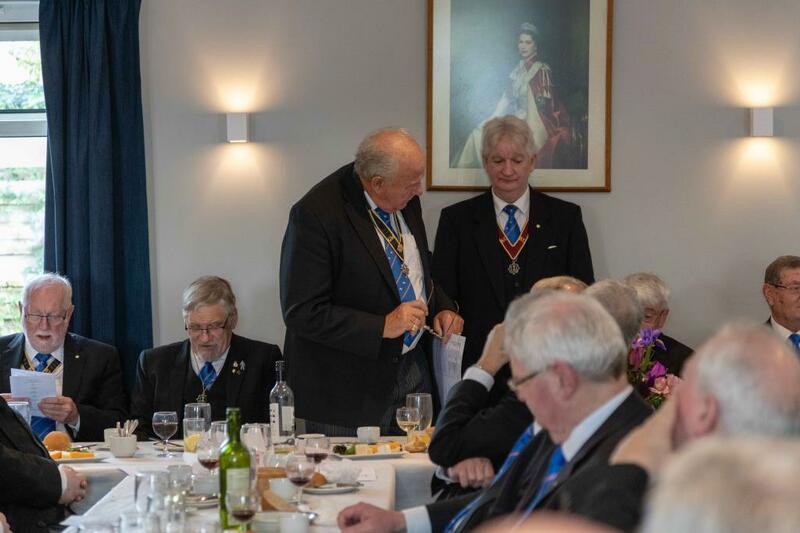 The Grand Master and his team arrived with expectations of a Grand Ceremony and Festive Board afterwards, which I am delighted to say far exceeded those expectations. How did this momentous occasion arise? 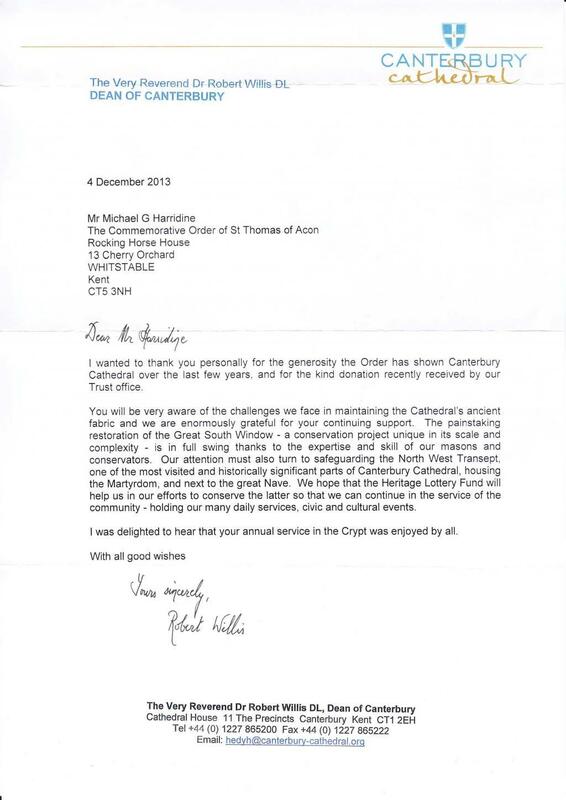 Well in 1999 Roger was approached to join the order as it was thought there should be a Chapel in Canterbury especially as the order is based around Thomas Becket, who as you are fully aware was the Archbishop of Canterbury murdered by callous villains. As it happened on the 27th November 1999 Roger was the representative Candidate along with 20 other Candidates was admitted into the Order and subsequently on the same day became a founder of the Canterbury Chapel, No7. Having been admitted into the order by Sir Barry of Ilford, the Grand Master at the time. The consecration was a memorable one for Roger as during the ceremony the contents of the censer was spilt on the Temple carpet. It was smouldering away and the Grand Marshal, Keith Ansell had to pick up the embers with cotton gloves. He ended up with burned fingers and mittens. Roger became Worthy Master of Canterbury Chapel in 2004 and subsequently was a founder of Geoffrey Chaucer Chapel, No 63. He has now reached the pinnacle as Grand Preceptor of the Province and will lead the Province for some years to come. Finally, for the scholars out there, there is a book called “Becket’s Bones” by John Butler of the University of Kent. He wrote on the whereabouts of Becket’s remains after his shrine was dismantled by Henry VIII “Reformation”. Roger made a small contribution to the book and is listed in the credits. This came about when was Clerk of Canterbury Magistrates’ Court when two lads appeared having been charged with attempted burglary of Canterbury Cathedral. They were going to try to prise open one of the tombs in the Cathedral which they thought contained Thomas Becket. They were students and only amateur burglars and were caught before they could attempt it. So, Roger has had a very small part in the story of Thomas Becket. It was a hot and sunny day when members and visitors gathered for the Grand Preceptor's Annual Council in June 2014. In addition to the usual business, four banners were dedicated. This is a colourful ceremony not often seen in 'quadruplicate'. 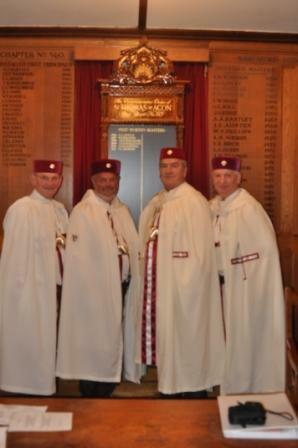 The first banner Reginald Fitzjocelyn No 74 was brought into the Temple escorted by four bodyguards and presented to the RW Grand Preceptor of Wessex. He called upon the Prior for an oration describing the founding and history of the Chapel name. It was then blessed, and presented to the Worthy Master of the Preceptory. The new banner was paraded around the Temple with great pomp and dignity accompanied by a regal march and celebratory fanfare. This was then repeated three times for the banners of Priory of Woodspring No 97, Paul Bushe No 101 & Chapel of King Ina No 102. On this occasion the Deputy Grand Organist was playing a Wyvern Prelude digital organ, which had been brought in for the occasion. He said afterwards he was most grateful for the knights who carried this on such a hot day, and to the architect who'd had the wisdom to install a lift at the Nailsea Masonic Centre. Osric Chapel No 60 celebrated a double celebration at their meeting in Stourport today with the dedication of both their Banner and the Roll of Past Worthy Masters. The dedication was performed by the Right Worthy Grand Preceptor Sir David of Dudderston and the Right Eminent Provincial Prior Sir Barry of Clifton Campville. These dedications further enhance the progress Osric Chapel has made following its move from Gloucester to Stourport where the membership has flourished. 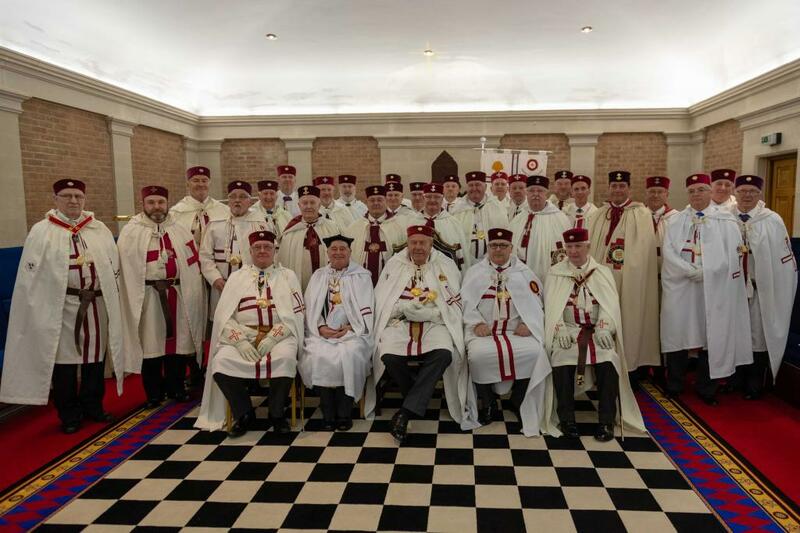 The Annual Pilgrimage to Canterbury took place on Saturday November 10th where a number of Knights many accompanied by their partners (175 in total) enjoyed our Special Service in the East Crypt of the Cathedral. The Pilgrimage Service was then led by The Most Eminent Grand Prior Sir Michael of Seasalter (Michael Harradine) and The Right Worthy Grand Preceptor of South Eastern Counties Sir Brian of Baldwins Hill (Brian Previtt). Sir Melvyn concluded the service by thanking everyone for their participation on a very wet November Saturday. From a personal perspective, it was my first visit and I found the day very moving and worthwhile, gave me an opportunity to meet several other Knights and obtain my “Chuffs”. I went to the Cathedral Evensong after our service which again was a very enjoyable service. On Saturday 20th of October, the Province of Lancashire was honoured to receive The Most Worthy Grand Master, Sir Melvyn of Wud Plumpton K.H., when he Installed Sir William of Atherton, William David Swindlehurst as the new Right Worthy Grand Preceptor for the Province of Lancashire. The Most Worthy Grand Master was accompanied by The Most Eminent Grand Prior, Sir Michael of Seasalter K.H., supported by a galaxy of R.W. Grand Preceptors, R.E. Provincial Grand Priors, his Installing Officers and Grand Officers, together with many Sir Knights from this and other Provinces.